The C100 Z-Finder Pro is an optical viewfinder, specifically designed to attach to the Canon C100 cinema camera LCD. This Z-Finder will magnify the LCD screen by 1.8x and has a diopter for specific focus tuning. It cuts out any extraneous light and offers an initial point of stability by pressing your eye against the large eyecup. 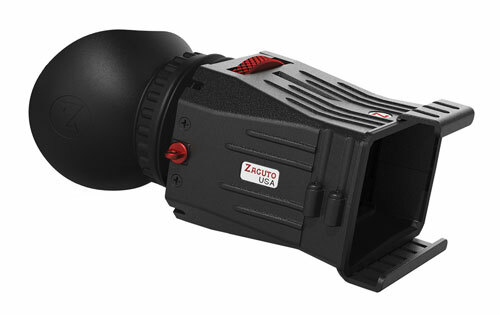 The C100 Z-finder Pro comes with a 40mm diameter Zacuto optical lens, anti-fog coated protective covers, and all necessary additional accessories for the Canon C100. The diopter allows you to dial in the focus to match your eye. If you need extra focal points you can use the included Z-Finder Extender Frames. These are semi-permanent stackable frames that attach to the body of the Z-Finder Pro and extend the Z-Finder glass further away from the LCD screen for people who are farsighted. The C100 Z-Finder Pro is comprised of three important parts. The first is the viewfinder itself with the lens, diopter, and eyecup. The second is the mounting system. The mount slides onto the Canon C100 LCD screen when articulated. The viewfinder snaps on and off the frame and can hang around your neck on the included lanyard when not in use. The third part is a set of Z-Bands that attach to your camera via a screw hole on the film panel included on the left side of the camera and then clip into two ball sockets on the Z-Finder itself. These Z-Bands add tension and support to the mount so the LCD screen and viewfinder can be set at any angle. Without the use of the Z-Bands, the hinge on the LCD screen cannot support the viewfinder (in any tilted up positions). The C100 Z-Finder Pro is specifically designed for the Canon C100 camera and is not compatible with any other cameras or alternate set ups.